thank you, thank you for all of your well wishes and prayers! You truly warmed my heart and I can happily report that I'm feeling back to normal (although I'm sure my sons would likely say that I never have been "normal"). In fact, I felt so well that I managed to do a little thrift shopping. I was on the hunt for some cheap art for my back patio. In my effort to make the patio an extension of my home, I thought it would be wonderfully unexpected to display a few pictures and oil paintings. 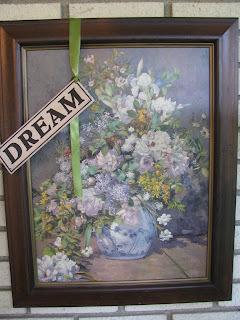 I thought this vintage floral, along with the dream sign, would be ideal. 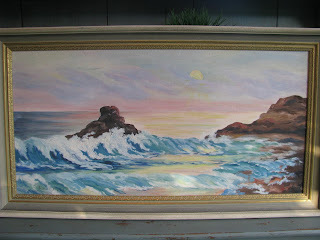 A few weeks ago I found this oil painting of an ocean landscape. Now when the weather gets too hot, I can sit on my patio with a tall glass of lemonade and envision myself at the ocean. 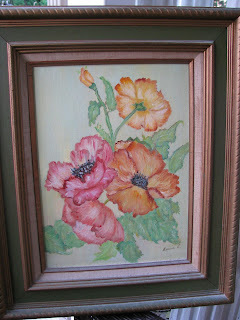 And this past weekend I found this charming floral oil painting. The painting spoke to me. The frame did not, but I knew it would be a quick and easy fix. I removed the painting, put on my paint mask and sprayed the entire frame, cloth inset and all, a pretty shade of apple green. Now it looks fresh and fun and will be the perfect addition to my cheap patio art. Love the green color! It makes it so outdoorsy and brought it up to date! Good work! You found some great artwork, but my favorite is the last one! 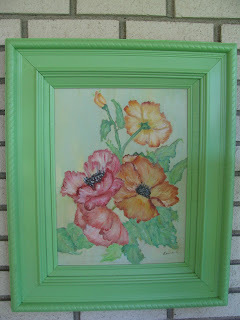 The green you used for the frame is perfect! Love the apple green paint on the frame! What a difference that green paint made!! Neat idea to add paintings to your patio! Joy, those are all pretty! Love how you changed out the frame, it really looks so whimsical now. I'm loving the apple green frame in the last one! The power of Prayer - very cool ! I love your new art ! Beautiful artwork...the green apple sure makes me smile!! I love that green, so pretty! Awesome transformation! How fun! I Love the great on the frame. Those Are beautiful prints! I am jealous of the oceanscape! You found some great wall art!! I love the green frame. It really makes those pretty flowers stand out! Now I would love to see the "art wall"! Happy Met Monday, a bit late! lol!! My parents had that painting when I was a kid! It's called Land's End, right? how funny. of course, it wasn't the original, but still!